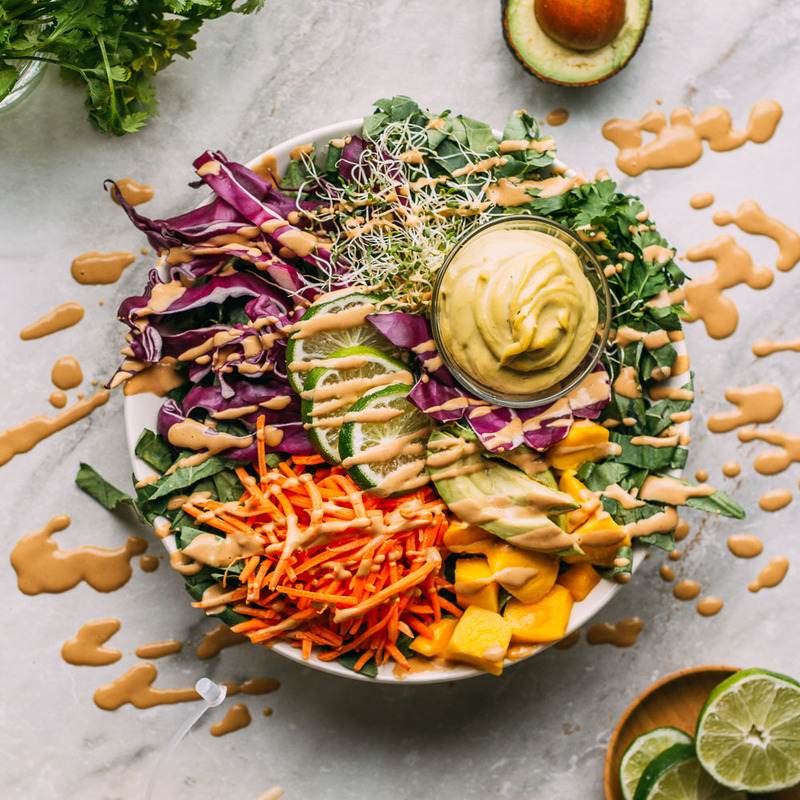 If you’ve never had the pleasure of diving into a deconstructed Collard Wrap Salad Bowl, allow me to introduce you to a veggie lover’s paradise. By the way, we’re not kidding. If you’re a fan of a classic collard wrap, our new Collard Wrap Salad Bowl may very well become your favorite casual meal. So, What’s So Great About a Deconstructed Collard Wrap Salad Bowl? • everything in this delightful dish is raw and thrown into a bowl; how easy is that? 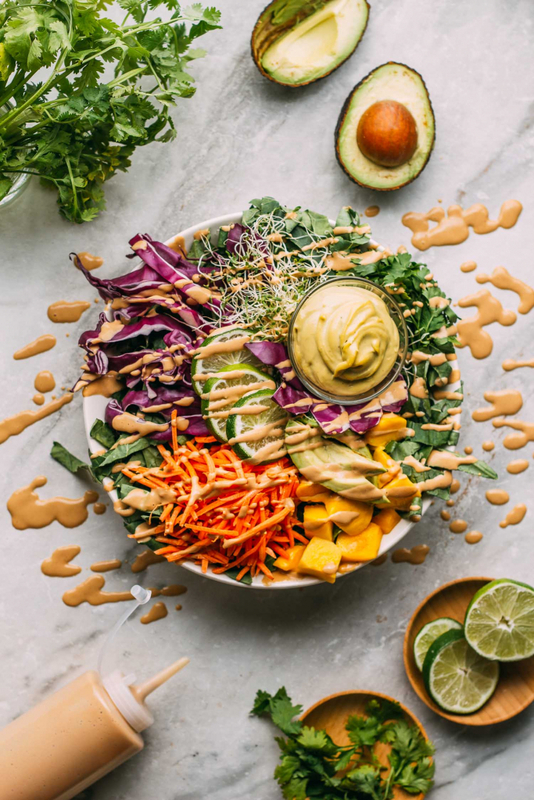 After rereading this list of ingredient explanations, we’ve come to the conclusion that we could live on this bowl, dairy-free cheese, and sauce! The Thai Inspired Peanutty Dipping Sauce is just a little salty and spicy thanks to the hit of fresh ginger. Also, the peanut butter base is a bit sweet so it evens out the fiery ginger and garlic. You’re going to love this sauce! And you’ll also appreciate that the Parsley & Thyme Cashew Cheese we show nestled in this salad bowl is easy to make ahead. The herbs make this plant-based vegan cheese pair exceptionally well with the earthy green flavor of the collards. You’ll want to keep a batch of it on hand for when you just have to have a delicious smear of cheese. And if you don’t have access to fresh mango, no worries! We usually use some thawed frozen mango chunks in our Collard Wrap Salad Bowl. Using frozen fruits and vegetables is the easiest way ever to speed food prep along. For the sprouts, if you’ve ever thought of trying to grow a batch of countertop sprouts, do it now! Grab some mason jars, cute little-screened lid inserts, and alfalfa sprout seeds, and turn over a new leaf! It’s easy as pie to grow sprouts and they taste fresher than anything you’ll ever get from the store. When growing sprouts, you’ll find they’re significantly crunchier than the ones you get at the store. 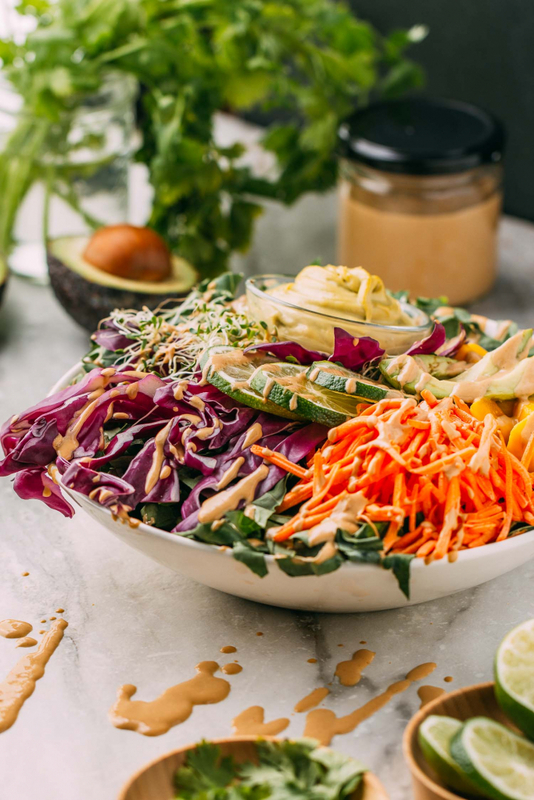 A huge Collard Wrap Salad Bowl is a new go-to meal at our house. You’ll never look at another collard leaf or bag of washed and ready to go collards the same. Now, instead of seeing an odd leafy vegetable that appears too big to fit in your fridge, you’ll see it as a super easy meal. And if you ever want to make this dish super portable to take with you on the go for lunches or picnics, check out our recipe for Mango Cashew Collard Wraps to get this recipe rolling! 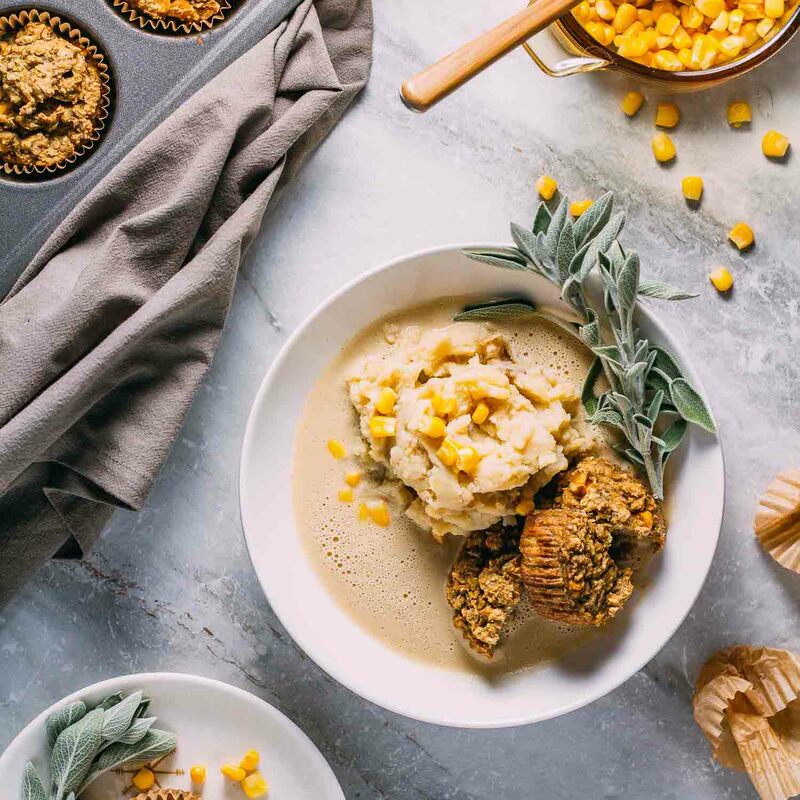 As always, we appreciate it when you kindly share this recipe so that your friends and family can benefit from a no-cook meal that tastes terrific and is super healthy to boot! 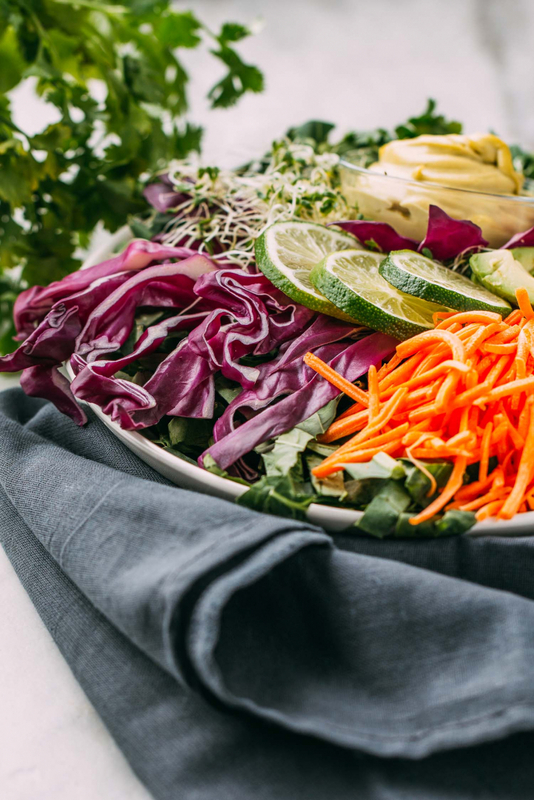 Our colorful deconstructed Collard Wrap Salad Bowl reaches out to your inner creativity. You’ll feel the freedom and inspiration, and you load in the fresh, raw, and healthy ingredients. Putting these bowls together is almost as much fun as eating them! How many times do we get to say that about making dinner or lunch? 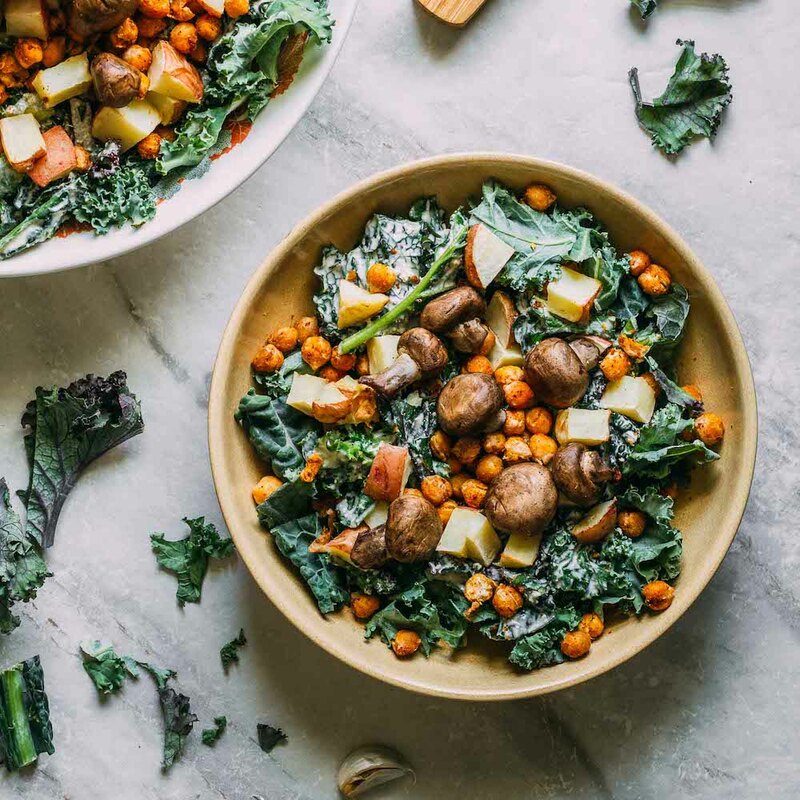 And as if fun and creativity aren’t enough, collards offer plenty of nutrients including vitamin K, vitamin A, manganese, fiber, calcium, and iron. 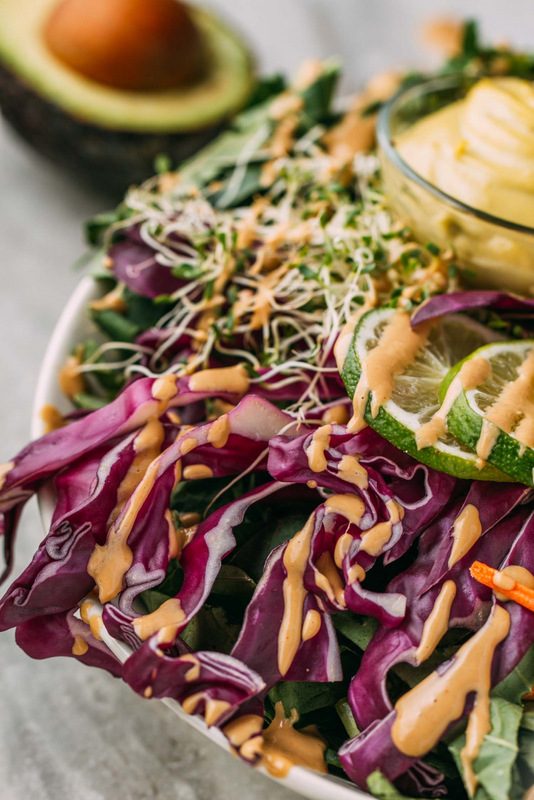 Paired with a helping of our Parsley & Thyme Cashew Cheese and drizzled with the Thai Inspired Peanutty Dipping Sauce, this bowl is a satisfying, flavor-filled dining experience you’ll return to again and again. And if you ever want to make this dish super portable for lunches or picnics, check out our recipe for Mango Cashew Collard Wraps to get this recipe rolling! one large bunch of collard greens, washed, drained and trimmed of hard stems, or to save time, buy a bag of prewashed and chopped collards - We use about a generous 2 cups or so per serving. 2 to 4 cups of red cabbage, sliced long and thin - Allow about 1/2 to 1 cup per serving. Haas avocado, peeled, pit removed and sliced - We usually use between 1/4 and 1/2 of an avocado per serving in this dish, depending on how heavy we plan to dip into the cashew cheese. 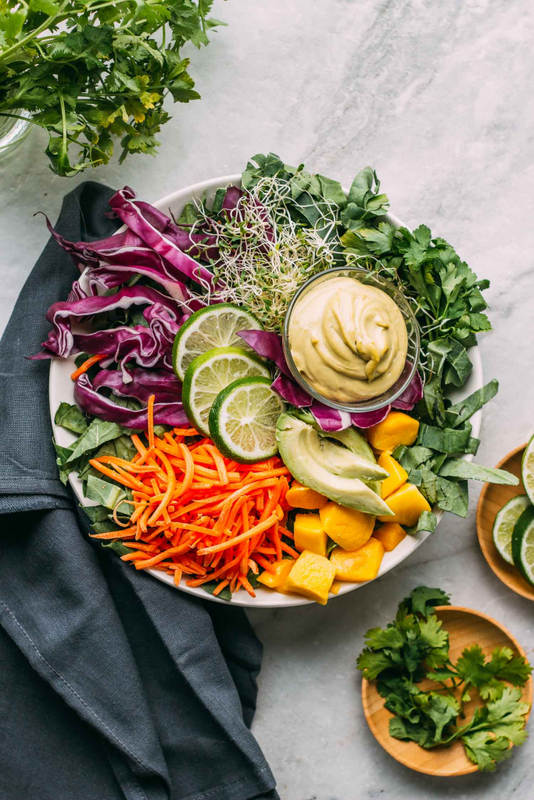 raw mango, peeled, deseeded, and cut into strips, or use thawed frozen mango that's already chopped - That's a time saver and makes this salad doable year around. We use about 1/2 cup or so per serving. In large bowls intended for individual servings, create a bed of collard greens. Layer in the rest of the salad ingredients in the arrangement you prefer, either tossed together or sectioned off, as we show in our photos. 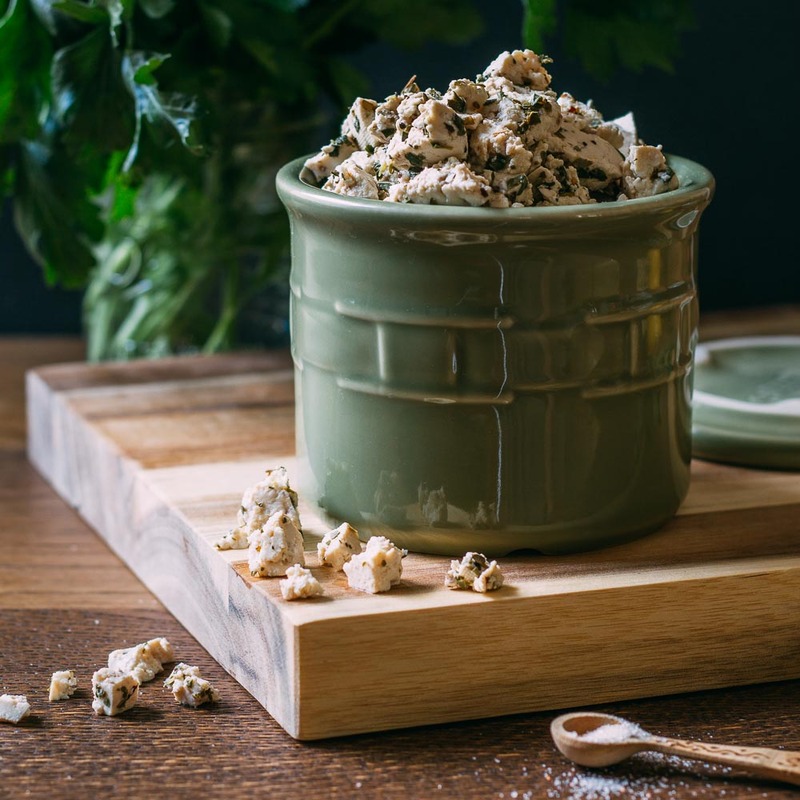 Enjoy your bowl drizzled with Thai Inspired Peanutty Dipping Sauce and a generous helping of creamy, homemade, Parsley & Thyme Cashew Cheese. For times when you want to make this dish super portable for lunches, picnics, or enjoying on the go, check out our recipe for Mango Cashew Collard Wraps and get this recipe rolling! We didn't include nutritional content since this is very much a salad where you pick how much of this or that you prefer to add to your bowl. However, the nutritional content for the Thai Inspired Peanutty Sauce and the Parsley & Thyme Cashew Cheese are at the bottom of those recipe posts.